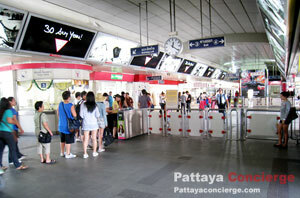 Information and Service Center of BTS is always next to the ticketing gate. Visitors can change your note to coins, can ask information of services, and information of major locations around the station. 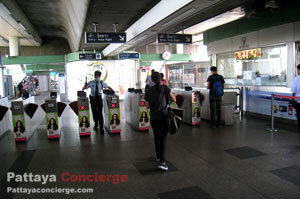 There are several types of ticket at BTS Sky Train. - Smart Pass Ticket: this type of ticket is suitable for those who need to use BTS frequently, because a trip with BTS is cheaper than usual. Gowever, to have this card, the deposit is required. - One Day Pass Ticket: This is a ticket offering unlimited trips for a day, not 24 hours; the expiration is only at midnight for that day. It is suitable for anyone having a plan to use BTS several times in that day. - Single-Trip Ticket: this is a standard ticket which will immediately expire at a destination. It is suitable for those who do not travel around by BTS frequently. Recommendation: a ticket for visitor is the single-trip ticket or One-Day-Pass ticket, depending on the purpose of using. 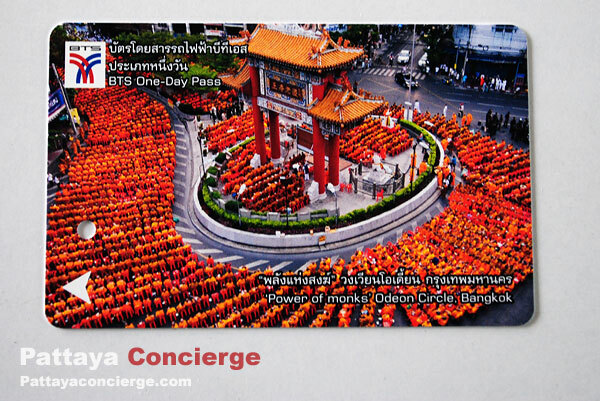 Visitors having a plan to travel in Bangkok by BTS for 3-4 times for a single day would suit to One-Day-Pass ticket because for several trip a day, the ticket become more value for money; visitors do not need to queue for changing coins; visitors can also keep the ticket home as well. 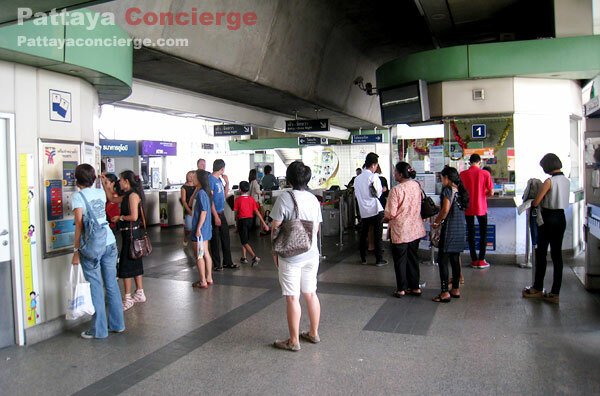 Although BTS Sky Train in Bangkok is an easy to use transport for many people, there are still those who come to Bangkok at the first time wondering about how to use this easy transport. In fact, BTS is not difficult to use even for a newcomer visitor. There are also officers to help visitors out nearby. However, if you are looking for steps of how to travel around Bangkok by BTS, you can find it below. 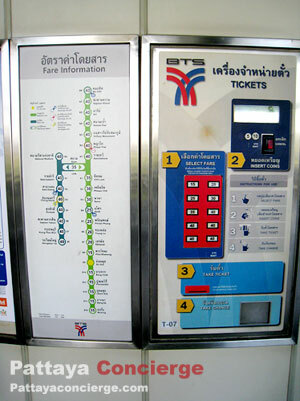 - First of All, have a look the route map of BTS at the ticket machine. The location you are at is the station with solid green color; the others are white color with the price for getting that destination. After knowing the price, make sure that you have enough coins to insert to the machine - the machine can accept only 5 and 10 Baht coins. If you do not have enough coins, go to information counter; you can change coins there. 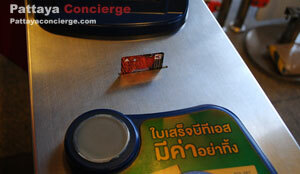 - Press a ticket price button, where the price starts from 15 Baht to 60 Baht, increased by 5 for each. After pressing the button, it will turn to the red color. - Insert coins following the ticket price. Don’t forget that the machine can accept only 5 and 10 Baht coins. The machine can give you changes when you insert money than it needed. - The machine will return you a ticket after your payment. Just take it from the machine. The changes returned (if any) will then be in the change slot. - After having the ticket, you can just walk to the gate to use the ticket to get inside. However, you need makes sure that you are going to the gate to get in – for the gate to get in, there is a sign of green arrow in the front, but for the gate to get out, there is a red-cross sign. - When you have inserted your ticket into a machine at the gate, the ticket will then release at the top of the gate. Just after you take the ticket, the gate will open for you to walk inside. Don't make an hesitate to move inside because if you get in too slow the gate can pinch on your body. * If you are inconvenient to walk pass the gate for some reasons – having a large or several bags, for example – you can ask an officer beside the gate to open a larger gate at the side for you. The officer will then deal with your ticket with the machine for you. - After getting inside, there are two sides for you to go on. You need to look at which side will pass your destination; one will go to the front and another will go to the other way. There are signs to tell you the end of the route, so it means that you will need to know the last station of each side as well. In the case you really have no idea about it, ask the officer at the gate. They will show you right away. 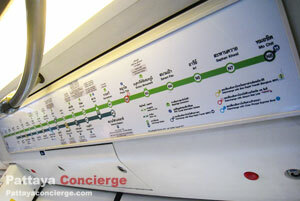 - After having chosen a side, you will have to get up to another floor which is a platform for the sky trains. On the floor of the platform, there are marks to show you where you should wait for the train. The purpose of this marks are to ensure that the queues will not block those who are going to get out from the sky train. 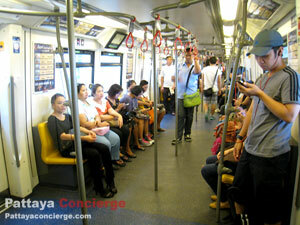 - Inside the train, there are seats provided on two sides. Above each door, there is a route map of BTS sky Train with a little additional information of each station; some train has digital route maps showing the information about this BTS clearly. 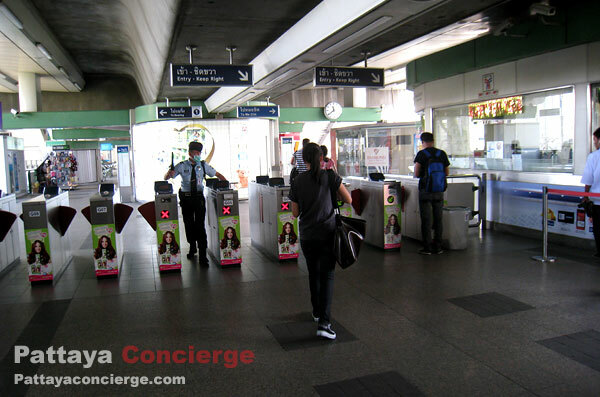 Before getting another station, there is a recorded voice to tell you what a next station is, but if you cannot hear it clearly, you can have a look on the screens provided to see the information of the next station. - After getting out the train, you need to go down stair to exit that station, but do not for get to have a look which exit is suitable for your destination. 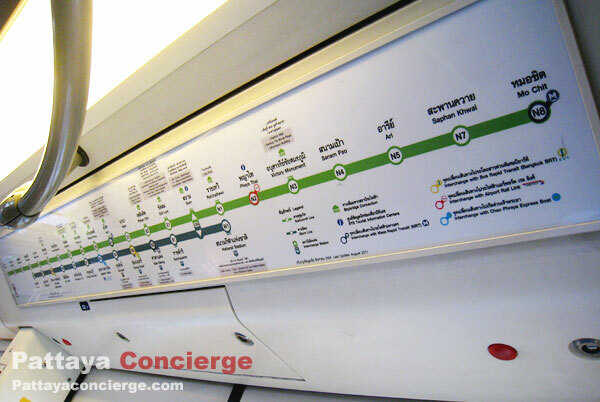 * In the case you notice that you get out from the train on the wrong place, you can still get in another sky train without paying more money, as long as you are still in the BTS system. 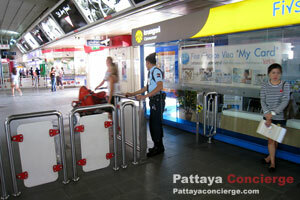 Note that, your ticket will expire after 120 minutes, and if you stay longer than that you will be charged for 40 Baht. ** For switching BTS line at "Siam Station", it can be a little confusing if you go there for the first time. Look at the notice sign carefully because there are two floors for catching a sky train here. Royal Grand Palace (and Temple of the Emeral Buddha) - the most popular tourist attraction in Bangkok . 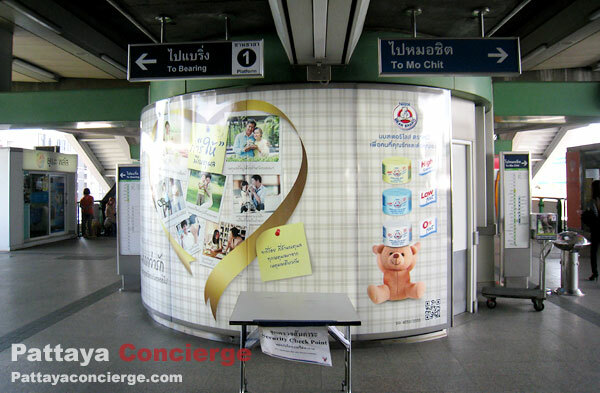 Major Shopping Centers - the difference of major shopping malls in the center of Bangkok. Chatuchak Market - the largest weeked market in Bangkok, where more than 8,000 stalls available. Chinatown - The area of Gold shops and delicious street restaurant. Gold Buddha Temple is also located nearby. Airport Link - an easy and inexpensive way get from or to Suvarnabhumi Airport, the international Airport. Tuk Tuk in Thailand - one of what visitors recommend others for things must-do in Thailand.